Buoyed by 13 percent passenger growth over the past 12 months and a continued strong performance of its U.S. operations, Norwegian Air said it remains “fully committed” to delivering on its plans to maintain its short-haul networks within Europe and expand medium- and long-haul services between Europe and the rest of the world. It also plans to exploit new and underserved markets, the company noted in an investor presentation outlining its plans for 2018-2020 and confirming October 16 as the date for the delayed start of Norwegian Air Argentina (NAA) flights. The government of Argentina granted NAA the rights to operate up to 153 domestic and international routes late last year and NAA obtained its operator’s certificate in January. Plans call for first services to connect Buenos Aires’ city airport Aeroparque Jorge Newbery with Córdoba and Mendoza, while a further three routes from Buenos Aires to Bariloche, Iguazú, and Neuquén start in December. The airline has scheduled services to Salta to begin January. “The imminent start of our operations confirms the interest and long-term commitment we have in Argentina,” Norwegian CEO Bjørn Kjos said. NAA plans to operate between 10 and 15 aircraft on 246 flights per week by the end of its first year of operations, aiming to transport up to 2.2 million passengers. It said it expects to have deployed 70 aircraft “within a period of five to 10 years,” operating on a network spanning more than 100 routes and serving over 12 million passengers. 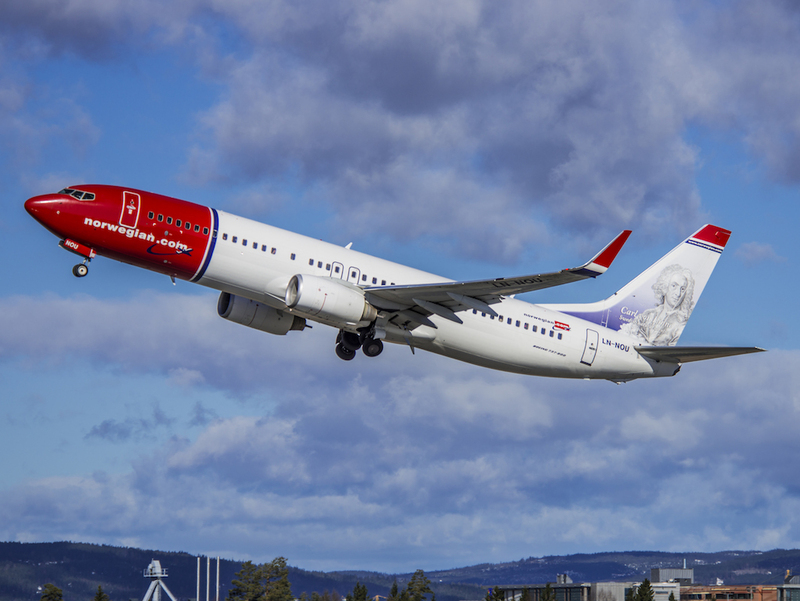 Norwegian said a Boeing 737-800 fitted with 189 seats will fly on the first Argentinean domestic routes, though it did not detail its future fleet plans for NAA. Much appears to depend on the planned divestment of part of its large order book with Boeing and Airbus to reduce debt. As part of its 2018-2020 strategy, the low-cost carrier informed investors on September 4 it will enter a more moderate growth phase, focus on cost reduction initiatives, and “stick to its plan to sell up to 140 aircraft.” Norwegian already last year disclosed that it began exploring options for selling a stake in its Irish leasing arm, Arctic Aviation Assets. It sold a first batch of six Boeing 737-800s in late August. The group hopes to “disclose news about the transaction” before the year-end, CFO Geir Karlsen told investors, Reuters reported. “The Airbus A320neos are for all practical purposes for sale,” Karlsen said. According to Airbus, Norwegian has placed firm orders for 65 A320neos and 30 A321LRs. Meanwhile, Norwegian continues to execute on plans to increase its widebody fleet to 32 Boeing 787s by the end of this year, up from 12 in 2016, and renewing its core fleet. It expects to take delivery of 11 Boeing 787-9s and to add 12 Boeing 737 Max 8s and two Boeing 737-800s, while redelivering four older 737-800s. By year-end, its fleet will consist of 164 Boeing narrowbody and widebody aircraft, a mix of owned and leased. It plans to increase the size of the fleet to 183 by the end of 2019 and to 212 by the end of 2020. Delivery schedules call for its first four owned Airbus A321LRs to join the fleet next year. Overall, the group’s capital expenditure commitment for aircraft purchases, including predelivery payments, amounts to $1.75 billion for 2018 and $2.2 billion for 2019, according to the investor presentation.